This kit will allow you to put together your complete rear end package with the exact parts you want to use. Choose your fender and bag style then add the taillights of your choice. 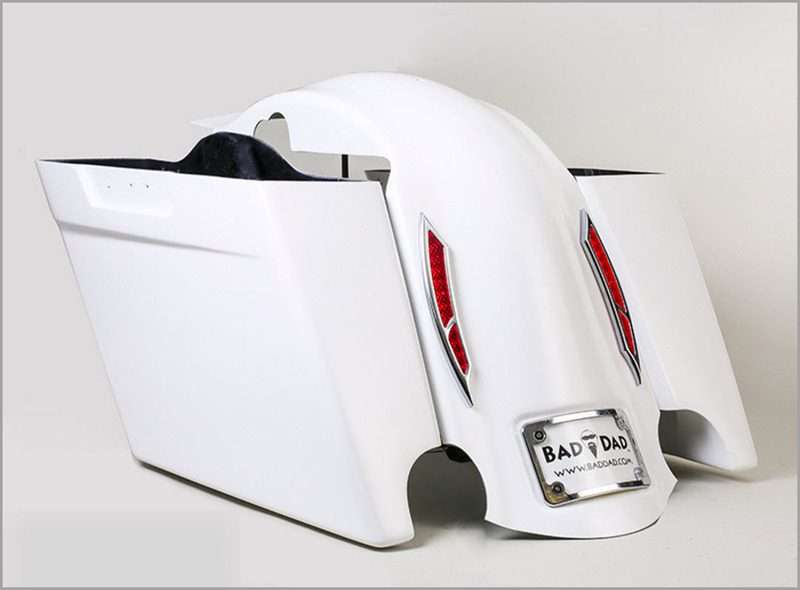 Rear Fender: Bad Dad's Bagger Rear Fender is designed to install over the bike's frame rails to hide the bike's struts and other hardware. The Bagger Rear Fender is made of high quality hand laid fiberglass and features increased flange width for a wider & smoother look. The Bagger Fender can be installed over your stock fender or the Bagger Fender can be used a complete fender replacement by adding our Fender Eliminator Kit. The Bagger Fender is available with single, dual or no exhaust ports fr your custom application. Stretched Bags: Bad Dad's Stretched Saddlebags are each pre-drilled and pre-fit to make this a simple bolt-on replacement for your original bags. You will reuse your stock saddlebag lids and hardware. All of Bad Dad's Stretched Bags are finished in final primer which is ready to go directly to paint. Taillights: Bad Dad now offers two custom taillight options to light up your bagger. Both Bad Dad's 957 Taillight and 992 Taillight designs are great ways to add a custom touch to your custom project. These custom taillights are CNC cut from billet aluminum and feature incredibly bright LEDs. Both designs are available in black or chrome. Detachable Accessories: Add Bad Dad's Backrest Relocation Kit to make this fender compatible with your detachable backrest & sissy bar. Add Bad Dad's Tour Pack Rack to retain your detachable Tour Pack. The Bagger Fender is not compatible with a detachable luggage rack. All of the parts in this custom Bad Dad package are proudly made in the USA.